We all know that hearing those two little words of gratitude can push us to do even more, or at least make us feel like our efforts are noticed. It takes zero time to say thank you to your mom for calling back your venue to clarify their liability requirements, or bestowing your bestie with those two words because she put together the best song list ever for your DJ. Planning a wedding takes a village. Say “thank you” often and people will feel more inclined to continue helping. Revel in every little moment, from cake tastings to seating charts, and remember that no wedding happens without a hiccup or two. Your day will still be perfect and best of all: it will be yours! Happy planning, all you brides-to-be! You can plan a wedding down to the last detail, but inevitably there’s something that doesn’t quite go off without a hitch. 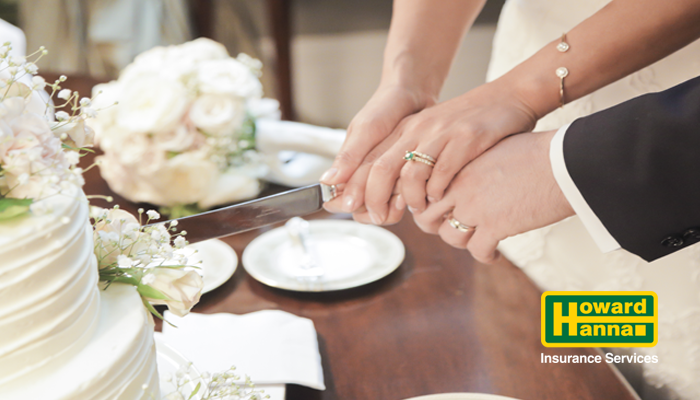 The best part about surprises on your wedding day is that they become a fun story to tell! Here are some wedding day memories from the Howard Hanna Account Management Team. Kevin: Our cake wasn’t properly supported, and it started tipping during our first dance. You can see the progression in the wedding video as the lean becomes more pronounced. Finally, my mom and my wife’s aunt grabbed it to keep it from ending up on the floor. When we got out the top tier a year later for our anniversary, it still had handprints in the frosting. Tina: We planned the wedding for January 21st and our engagement party for December 17th. After numerous calls to Australian immigration trying to get everything in order, my fiancé was finally told the laws were changing on December 18th and I would have to go back to the U.S. and wait for approval to immigrate, which could take a year. So, he made all the arrangements and then called me to say I was getting married in five days! We actually swapped the wedding and engagement party dates. Katharine: All three of our groomsmen showed up to the hotel without their ties, and the best man’s wife had to run out and get some at the last minute. Jessica: We were locked out of our venue the day of the wedding. Luckily, I had the best cake baker ever, and she waited with me and told me her funny wedding story: her three-year-old niece accidentally sprayed a red Huggie all over her white dress and she spent the entire night wearing the giant stain. Her story kept me calm until the township guy finally arrived to let us in. Ruth: Coming back from my hair appointment the morning of the wedding, I ran into my maid of honor’s parked car. A crowd started to gather at the scene, and a couple of people were taking pictures of the accident, but we had to leave for the church. I just kept yelling that we knew each other and it was okay. Danielle: I was greeting my guests at the reception when all of a sudden the DJ started playing the Electric Slide – my favorite. I ran to the dance floor and started busting out my own moves. Before I knew it, I was staring at the ceiling with tulle covering my head. I had fallen and fallen hard. I was too disoriented to know which way was up and lay there looking like a giant marshmallow. A few guests ran over to help me, but it wasn’t until several minutes had passed that my new husband finally came to check on me. I got the feeling he was more embarrassed than I was. Three members of our account management team have recently tied the knot. Here is a glimpse into each of their special days. When I met with my florist, the first thing he said to me was, “Tell me about your wedding.” Very pragmatically, I listed off the number of boutonnieres and corsages I would need for the wedding party. The florist took a few half-hearted notes, and when I had finished my catalogue, he leaned forward and said, “That’s all good information to have. But tell me about your wedding!” His enthusiasm was catching, and I was soon gesturing animatedly as I described the kilt that my husband would be wearing and the gorgeous stained glass in the tiny chapel. Pulling in all the details, the florist designed a bouquet with Scottish thistles and lavender roses encompassed by a knot of curly willow. It was the perfect finishing touch to a day that celebrated the Scottish heritage on both sides of the family. The ceremony flew past in a blur, but I’ll never forget the moment when my husband and I held hands and declared that on this day, two families became one. The wedding was over. It was beautiful and full of love. We returned from our fairy tale to our daily lives waiting for the photographers to give us our final pictures. The day we received them we were so excited to snuggle up on the couch and look at our day. We were completely blown away. I saw a photo of my father’s hat sitting in the pew and started to cry. My father passed away the year before, but I wanted something of his to be there with me. I had charms made of his picture and placed them on my shoes so he could still walk me down the aisle. From the moment we said “I Do,” to shoving cake in each other’s faces, to the kids dancing like no one was watching, to my aunt and cousin dressing up as super heroes at our reception (we did get married two days before Halloween), almost every memory was captured. They’re proof that once, even if just for a heartbeat, everything was perfect. The best part about pictures is that even when the people in the photo change, the memories they contain never will. If I had to label my wedding, it would be backyard gala for Saturday and backyard picnic for Sunday. Yep, I’m completely crazy and planned a wedding weekend, two-day event. Luckily, we were blessed with the most amazing weather, in mid-July no less! Immediate family and our closest friends gathered for a custom-written ceremony and dinner at a Georgian mansion right out of my dreams. Located in Robin Hill Park, this rental has a sprawling backyard extending from the brick patio and a gorgeous gazebo, which held our ceremony. With handwritten vows, a thank-you poem to our parents, and not a dry eye in sight, we wed surrounded by love. Sunday bloomed into a backyard picnic held at Blueberry Hill Park. The laid-back barbeque vibe allowed everyone to eat, drink and celebrate our marriage. A re-reading of our vows and rose-inspired cupcakes helped cap the weekend. Would I do it again, yes, a million times yes! Grow Pittsburgh received a grant from Westfield Insurance Foundation thanks to the help of Howard Hanna Insurance Services. The grant is part of the Westfield Legacy of Caring program, which invites Westfield independent insurance agencies to nominate a local nonprofit in the areas of disaster recovery, insurance pathways, family stability or safety. We are honored to partner with Westfield Insurance and Grow Pittsburgh to allow us to help make our local communities better places to live!